Since Windows 8, Windows Defender has been provided as a built-in component of Windows, protecting against malware. However, there’s a lot to be said for getting add-on third-party protection for your computer. This doesn’t necessarily have to be paid for, as there are some good free options. Naturally, the companies involved hope you’ll like the product so much you’ll upgrade to the paid-for version. One of the top free packages is by Bitdefender and it’s this that we’re looking at right here. 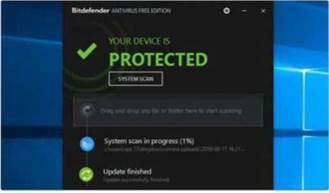 While the free edition of Bitdefender is more than adequate with anti-virus scanning, anti-phishing technology and ransomware protection, the paid-for version of Bitdefender – called Antivirus Plus – also includes a VPN, a password manager, and different modes for different purposes – like reducing the number of notifications you’ll receive when working or watching movies. It’s the free version we’re looking at here. The free version of Bitdefender will protect you against all the key online threats and it’s easy to download, install and use. Go to www.bitdefender.co.uk/solutions/free.html to get hold of it and click the Free Download button. 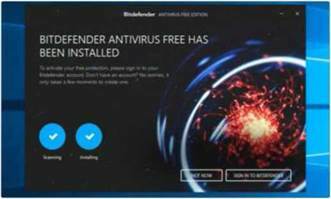 Bitdefender Antivirus Free will stay updated, so you’ll always have protection against the latest threats – updates happen automatically in the background. Should you wish to, you can upgrade to the paid version of Bitdefender anti-virus at this point. This includes a VPN, so you can encrypt all your web browsing as well as a useful password manager. For basic use, Bitdefender Antivirus Free offers more than enough protection. If you’re a gamer it may well be worth considering the paid-for version as there is a game mode. 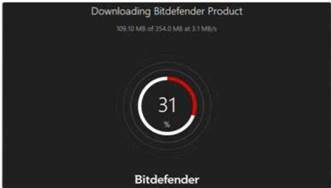 The Bitdefender installation file will download. If you’re in Microsoft Edge, you’ll be shown the dialog at the bottom of this window that will enable you to Run the installation file as soon as it has downloaded. If you’re using Chrome, you’ll need to click the file in the bar at the bottom of your browser window to start the install (or click on the file itself in your Downloads folder). The file you downloaded is just the installer. Before it can fully install, Bitdefender will download a much larger install file that may take a while. Ours was 354MB. If you have a very slow connection we’d recommend doing this part overnight. If you have a fast connection it should be no problem, however, and the app will tell you how far through the process it is. 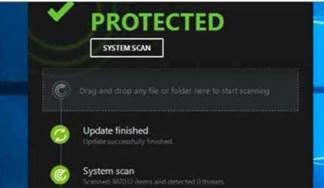 As it installs, Bitdefender will scan your system for the first time. This is to ensure there are no big identifiable issues with your system. After all, many people only download software like Bitdefender Antivirus Free when they actually have a problem with their PC! So it makes sense for the program to check that all is well with your computer from the off. To use Bitdefender Antivirus Free app you’ll need to have a Bitdefender account. Enter your name, email address and create a password if you don’t already have an account – don’t enter false details as BitDefender will email you to confirm your email address is legitimate. You’ll need to click the link in the email to confirm your account and prove your email address is yours. 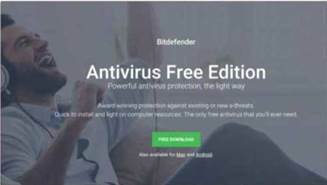 This is the main window for Bitdefender Antivirus Free. If you don’t see it, check for the ‘B’ icon in your notifications area on the right of your Taskbar – it may be hidden behind the drop-down arrow. Once you see the icon, click it to open this window. As you can see, you’re now protected from any threats. You can click to start a system scan should you want to check your PC. When the scan has finished, you’ll see this in the status area below. You can drag and drop any file to this window to manually check it. As you can see, the app has also performed an update. Bitdefender won’t necessarily let you know when it’s doing things like this, but notices will appear in the status area. 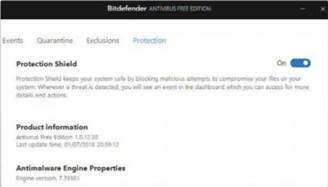 Security apps like Bitdefender are designed to run in the background. Bitdefender’s main window is very minimal, with only a few things to click on. As such, it’s very simple to use. You’re able to see at a glance whether your device is protected or not – you’ll be warned if there’s any problem. The Bitdefender app continually scans your system for threats, but you perform a manual scan if you wish, too. BitDefender will alert you if it finds anything suspicious. Any alerts appear at the bottom of the app’s main window. You’re able to check which ‘events’ have occurred on your PC – when Bitdefender identifies a threat, for example. You can just ‘set and forget’ BitDefender – it will tell you if there’s a problem, otherwise you can leave it alone. Click the cog icon in the top right of the window to access Bitdefender’s settings. As you can see in the annotation above, you can view all the ‘events’ that have occurred. Here you can choose whether to turn the Protection Shield on and off-this automatically blocks malicious files. You can turn it off if it identifies a problem with something you know is legitimate. 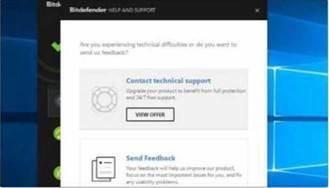 If you have an issue with Bitdefender Antivirus Free you can search the help pages at the BitDefender site – although most things should be self-explanatory. You will need to upgrade the software should you need more in-depth support. You’re also able to send in any feedback you want to relay using the handy link here. Again this window is accessed via the Settings menu.